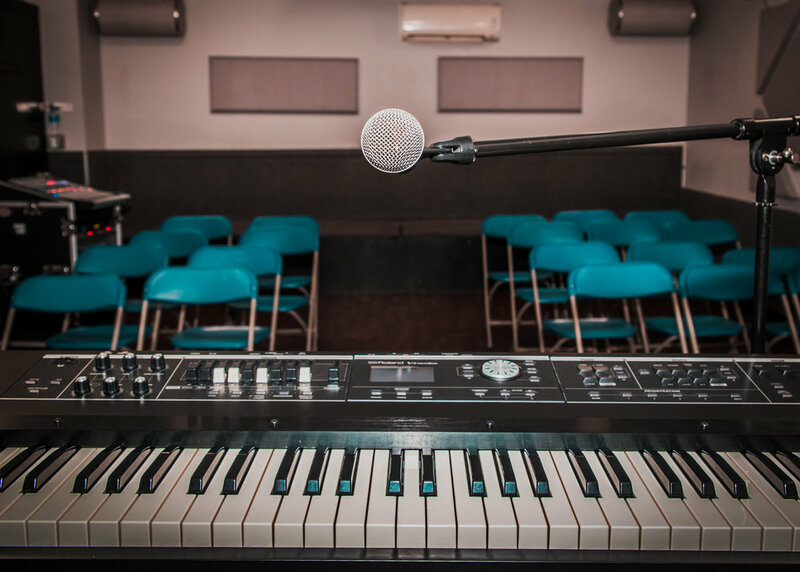 Here at Funkadelic Studios, our premier rehearsal space can be transformed into the perfect setting for your event! Whether you are hosting an Open Mic Night, an Album Release Party, an Industry Showcase, or another type of music-minded event, Funkadelic Studios is the place for your intimate party or event. Our large studio can accommodate up to 40 guests. Studio 1 rents for $100 an hour. There is a minimum 2-hour rental. Studio 2 can be added to the rental for an additional $30 an hour. We suggest using Studio 2 as a lounge, merchandise selling area, for food & beverages, green room or whatever your needs are. We insist that you see the space prior to renting the studio. We require payment in full at the time of the booking. Renters are responsible for any damages to the studio during the event. Credit Card information must be provided. Payment can be made over the phone. Studio 1 can be set up with or without seating. No hot food is permitted-Snacks are allowed. 5 Day Cancellation policy. In order to receive a refund, the event must be canceled in writing with at least 5 days notice. If cancellation is made within 5 days of the booking there will be NO REFUND. The only exception is if public transportation is not operating. Whether you are looking for a concert/traditional performance set up, or a more intimate “In the Round” experience, we’ve got you covered. Our friendly, knowledgeable staff can arrange the studio in any configuration to suit your needs. Please note that while snacks are allowed, hot food is not permitted in the event space. Click HERE to download our Event Agreement.